Conventional cotton production is characterized by high rates of insecticide use relative to other crops, and in some regions it continues to be scrutinized for forced and child labor. The Better Cotton Criteria focus on six key principles: crop protection, water, soil health, biodiversity, fiber quality and decent work. The Better Cotton Initiative (BCI) is now the largest cotton sustainability program in the world. In 2017, program partners trained 1.6 million farmers from 23 countries, and BCI farmers produced 2.5 million tons of cotton during the 2015–2016 season. Currently, Better Cotton makes up 12 percent of total global production. 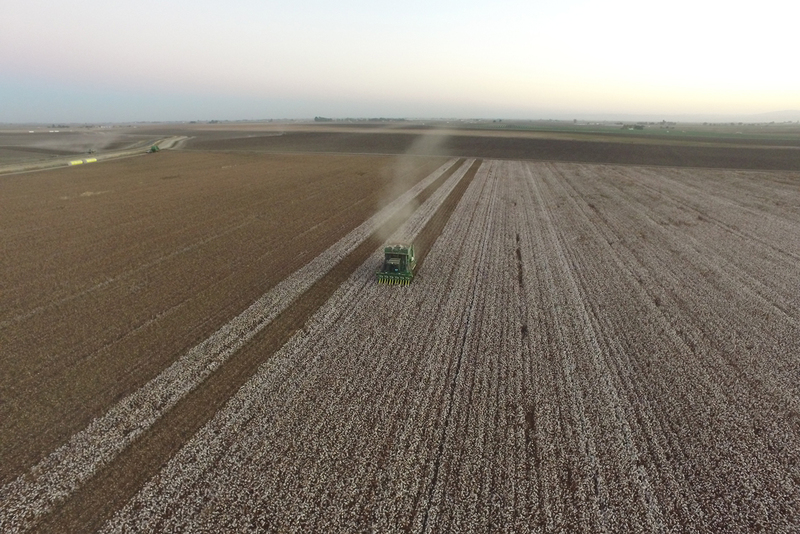 Photo courtesy of Bowles Farming Co.
BCI, committed to reducing environmental impacts and improving production over the long term, coordinates a capacity building program to help farmers around the world adopt Better Cotton production principles. Member retailers and brands contribute to a fund that provides grants to implementing partners to train farmers at the field level. This dual-track business model — with BCI managing standards credibility and growth and implementing partners focused on ground-level leadership — is a cornerstone of BCI’s program. Member partners see intrinsic value in participation as well. Straley’s gin processes cotton from a group of about 50 cotton farmers in West Texas. He works with each farmer to ensure they are meeting BCI standards and reporting on them annually. To verify member farms’ compliance with BCI’s minimum criteria and performance against improvement indicators, the organization uses a combination of self-assessments, second-party credibility checks and third-party verification. To be licensed to grow Better Cotton, farmers must meet minimum requirements set forth by BCI. To incentivize farmers to continue to improve, BCI grades them based on their improvement indicator scores. Those with the highest scores receive longer Better Cotton licensing periods. The assurance system categorizes farms by size — smallholders, medium and large — to accommodate differences in needs and scale. For example, BCI standards allow an exception for family smallholders to have their children work on their farm so long as it does not pose risks to their health, safety or development. From the farm to the clothing store, traceability gets more complicated. After it is picked, cotton is shipped for processing to various facilities, starting in the gin to separate the fibers from the seeds and pods. The bales of raw cotton fibers are then sold to merchants, who distribute the bales to yarn production facilities. At this point, lint from several bales is blended to produce more uniform fiber properties. This helps expedite the automated spinning process. The spools then make their way into commercial textile plants, where they are woven into fabrics. These fabrics are then shipped to clothing producers for finishing into garments. With cotton’s long and complex global supply chain, BCI employs a Chain of Custody system to measure implementation. From participating farmers to the gin, Better Cotton is segregated from conventional cotton. After the gin, an online MassBalance system allows traders to mix or replace Better Cotton with conventional cotton from the same country, and for spinners to mix or replace Better Cotton with conventional cotton from any country. 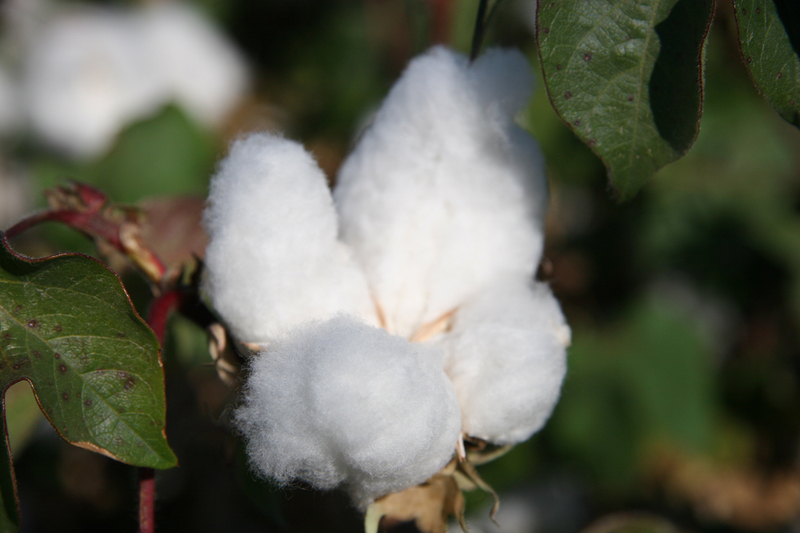 Because Better Cotton is not necessarily used in a retailer’s BCI order, they may receive a credit called a Better Cotton Claim Unit (BCCU) that accounts for one kilogram of Better Cotton in the overall supply chain. In this way, retailers can claim BCCUs in support of more sustainable cotton production under BCI standards without disrupting their ability to source cotton of any quality when they need it. In addition, end consumers who purchase products with BCI labels don’t end up paying much more than they would for products that don’t include BCI labels. Since BCI standards apply to production only, larger retailers and brands concerned about sustainability and labor issues throughout the entire supply chain may require manufacturers and mills to comply with Worldwide Responsible Accredited Production (WRAP) standards. WRAP certifies safe, legal, socially responsible and ethical manufacturing practices around the world. For a smaller group of cotton growers, suppliers and retailers, when third-party standards alone didn’t meet their needs, they teamed up to take traceability into their own hands. Together they created PimaCott. Until recently, pima cotton, a premium extra-long staple variety grown primarily in California, was not being traced at every step in the production process, so products labeled as pure pima could contain anywhere from 20 to 80 percent pima cotton. 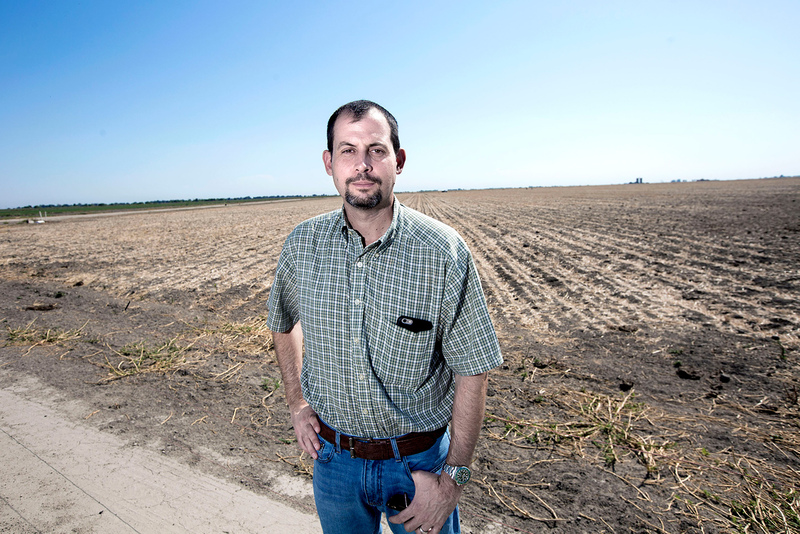 Then in 2014, Bowles Farming Company President Cannon Michael was approached by a major retailer that had run some tests on sheets labeled as pure pima cotton and found that they weren’t pure pima after all. 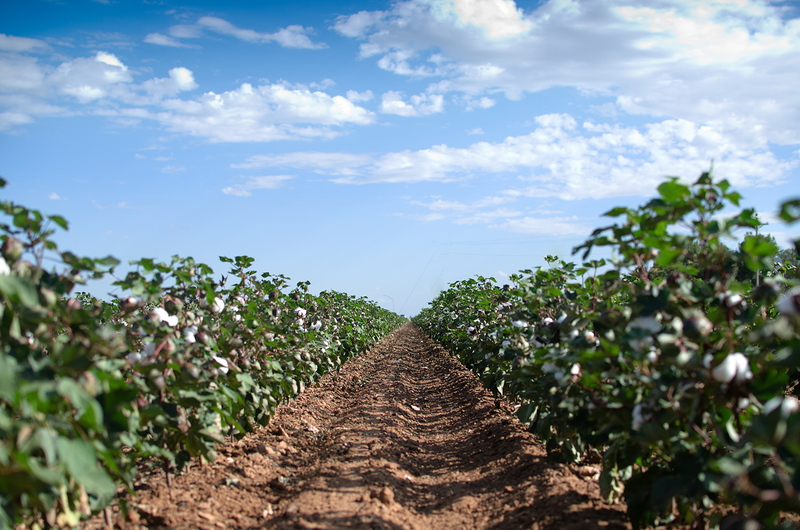 To address the purity issue, a group of California pima cotton farmers, including Michael, joined forces with a textile company, an agricultural merchant and a research lab to develop a specialized DNA marker that can be applied to pima cotton during the ginning process. The marker allows for tracking at every step in the process, all the way from the farm to the consumer. anything. It does cost more, but there’s also a story behind it.” – Cannon MichaelPhoto courtesy of Bowles Farming Co.
Michael’s gin was the first to be modified with the DNA tracing technology, and their merchant followed suit by purchasing the DNA tagging mechanism. They now work exclusively with a mill in India that installed a state-of-the-art facility following specific PimaCott protocols. Working together, they were able to create a pure product that consumers can trust. For Michael, the upfront costs were worth it, as long-term business investments and to ensure product integrity. Traceability in sustainable cotton production takes many forms. Currently, a BCI label denotes that the clothing or linen brand has purchased enough BCI credits that they are a supporter of BCI sustainability standards. It does not mean that the garment itself contains sustainably grown cotton. Alternatively, PimaCott labeled products are guaranteed to contain 100 percent pure pima cotton. Other certification programs like the Global Organic Textile Standard oversee adherence to organic standards throughout the supply chain and provide options for consumers looking to wear organic or sustainably produced attire. Kathryn Rogers is the communications manager for the County of San Diego’s Live Well San Diego vision, as well as chef and CEO at Vivacious Dish where she specializes in sustainably-sourced, refined sugar-free desserts. Find her recipes for deliciously vibrant living at VivaciousDish.com.